Harrison Pease, of Newtown, takes part in an anti-toll protest at the intersection of White and Wildman Streets on Saturday. The protest was organized by Stamford grassroots organization No Tolls Ct. March 9, 2019, in Danbury, Conn. Both sides of the toll debate have something to crow about in a new Sacred Heart University poll, which found a majority oppose the highway charges Gov. Ned Lamont wants — but more would be likely to back tolls if the money all went to bridge and highway spending. Apparently we can’t even agree on what we think. That’s the nature of an issue that’s both complex and evenly split. When asked straight-up whether they support or oppose implementing tolls, 59 percent said they oppose and 35 percent said they support the measure. So it’s clear, right? Nope. 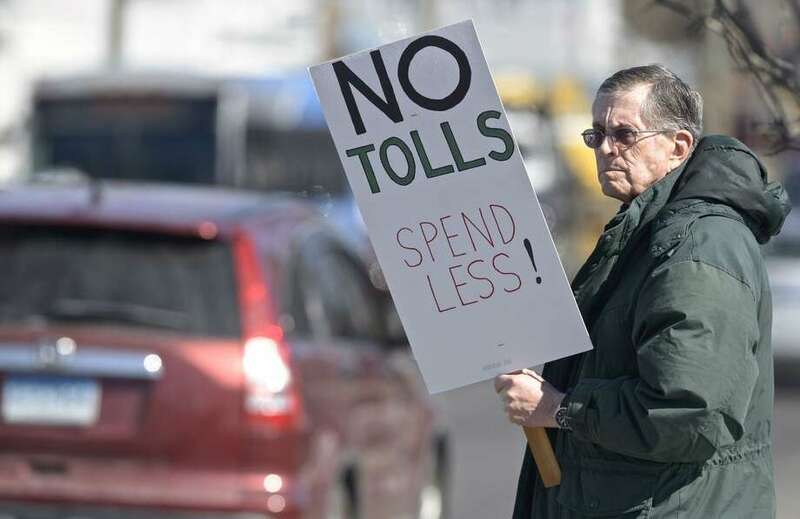 When asked whether they’d be more likely to support tolls if it were guaranteed that the money “would only be spent on roads, bridges and highways,” 51 percent said they’d either continue to support tolls or be more likely to do so. 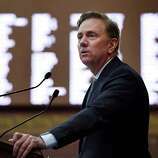 That prompted Lamont’s office to issue a statement saying the poll “underscores Connecticut’s need to move forward” with tolls. “This poll confirms what we already know: Governor Lamont’s plan has broad support from residents, labor, business, and elected officials,” Colleen Flanagan Johnson, Lamont’s senior advisor, said in the release. There are caveats on both sides. It’s unclear whether those 51 percent would support tolls, or, as the question says, would be “more likely” to support tolls. The poll, conducted by GreatBlue Research, of Cromwell, for Sacred Heart, queried 1,004 Connecticut residents, online and by telephone, between Feb. 13 and March 4. The poll claims a margin of error of plus or minus 3 percentage points, higher for subgroups. We shouldn’t even have a debate about whether the money might be used for road and bridge improvements — that’s federal law, not to mention state law, though the so-called lock box for transportation spending has plenty of leaks. “But this obscures the fact that Lamont has already proposed diverting hundreds of millions in car sales tax revenue from the Special Transportation Fund, and legislators are touting tolls as a way to improve Connecticut’s train system,” No Tolls CT said. The anti-toll group is right on that point, and Lamont isn’t helping the cause by mixing up how the money might be used. On the other hand, the poll questions did not include the estimate that out-of-state motorists would pay 40 percent of Connecticut tolls. So, if we’re talking about public opinion, we might ask whether motorists and taxpayers would rather pay $1.2 billion a year to get $800 million in spendable cash, by borrowing, under the Republican plan; or pay $550 million (the cost of tolls, minus tolls paid by non-residents, plus costs) to end up with $800 million in cash. The poll didn’t ask respondents about the Republican plan, which doesn’t lend itself to a poll question. The poll also didn’t ask about Lamont’s $800 million tolling plan, which would cost more than $200 million to implement. In short, the poll doesn’t tell us what people would think if they had the whole story. It’s a tough call but the free-money vs. expensive money argument should carry the day. Install tolls, make motorists from other states pay their share and lower other taxes. 28 percent thinking of leaving? On another hot-button issue, raising the minimum wage in Connecticut from $10.10 to $15 an hour, 71 percent said they favored the idea, while 26 percent said they opposed. That’s in line with national surveys on the minimum wage, although it has been ten years since Congress raised the national minimum to $7.25. One alarming fear — warranted or not — is people moving out of Connecticut due to high taxes, and a series of questions in the poll appeared to bear out those worries. Thirty-nine percent, or 389 respondents, said they’re considering changing their residence over the next five years. Of those, 72 percent said they’d look outside of Connecticut. That’s a total of 28 percent considering moving to other states or nations. The poll asked how many of those considered housing costs important in the decision to move and as expected, 70 percent said that was a very important factor. The poll didn’t ask about taxes in connection with a possible move, but in a separate question, 62 percent said it was either very difficult (21 percent) or somewhat difficult (41 percent) to maintain their standard of living in Connecticut. Of those 62 percent, more than half named high taxes or rising taxes as the reason it was hard to maintain their standards of living. Can all that combine to a conclusion that many people are exiting the state due to tax increases? Clearly some people are, as the state continues to lose residents to other states — although younger people tend to leave for more expensive places such as Boston, New York and Washington, D.C. Republicans are likely to say yes, the poll establishes the connection, and they might be right but the line of questioning is a bit indirect. As expected, majorities favored increased spending on school security (although residents were divided on whether schools should have more “trained and armed” teachers); and tighter restrictions and higher taxes on electronic cigarettes. On the ultimate question of quality of life, the good outpolled the bad: 15.5 percent excellent, 44 percent good, 31 percent fair and 9.5 percent poor. But the quality-is-declining crowd (27.5 percent) outnumbered the quality-is-improving respondents (15 percent). Questions about quality of life and economic conditions are best viewed over many years, when asked precisely the same way at the same time of year. So let’s call this a baseline.